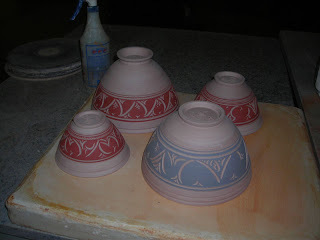 Here's the pictures from my Monday night glazing, throwing, and new pots. 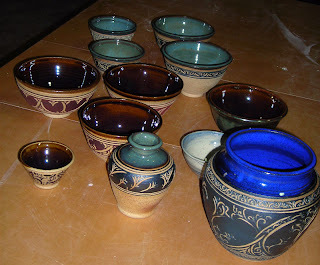 Empty bowls, glazed and ready for firing. 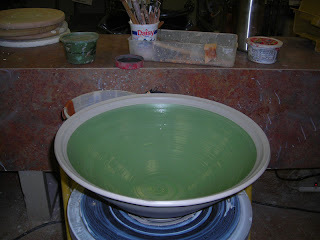 Here's some greenware - dried and ready for round one in the kiln. The only thing I threw Monday night - it's 15" across, 8" tall. It will be 20% smaller by the time it's finished. Finished work. I was happy with this batch. There's some pretty things there. Had some experimenting in this kiln load - something I haven't done for a while. (left) This is actually just clear glaze. 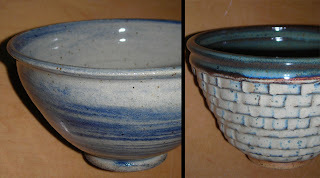 The bowl was the Calico clay with some blue slip trimmings kneaded in. Neat effect. Not sure it will go anywhere, but interesting. (right) An attempt at a "checkered" style that my uncle, Tim Langholz, used. Not bad for a first attempt, but still a long way to go before I can do it justice.